Discover what your clothes, music, food and home might have been like in 1952. Listen to Elvis Presley's first Number 1 hit "Heartbreak Hotel". Hear samples of jazz music popular with American writers and artists known as the "Beat Generation". See a 1950s fashion show showcasing designs by Christian Dior. 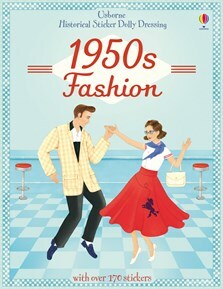 A detailed look at fabulous 1950s fashions from around the world with over 170 historically accurate stickers with which to dress the vintage models. Children can dress the characters in outfits ranging from American jive skirts for dancing to the latest London Teddy Boy trends and Dior’s ‘New Look’. Informative notes, photographs and sketches explain each 'look' and add historical context. Includes stickers to colour and decorate at home to create original outfits.